Samsung Front Load Washer Error Code dS or d5 – How To Clear? My Samsung washing machine has an error code, it shows DS or D5 on the display. What does this fault code mean? It is coming up on my display panel and it will not go away. I am wondering what may be wrong with my Samsung washer. Can you also tell me how to clear this error code? 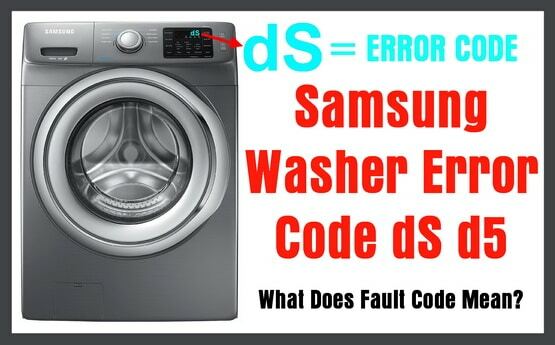 The fault code you are getting on your Samsung front load washer is dS error code. The display may look like D5 but the true error code is dS. The Samsung washer dS error code means that “The door was opened while the washer was running” OR “The washer thinks the door is open or unlocked during the wash cycle”. To fix this error in the most simple way, Close the door tight and restart the wash cycle. If the error dS reappears after restarting the wash cycle, try unplugging the washer for 5 minutes to clear the error code. 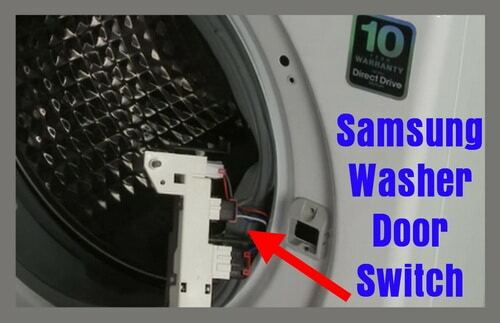 If the Samsung washer error code dS does not go away after simply shutting the washer door or unplugging the washer, you may have another issue. If the door open error dS displays at all times, there may be something obstructing the door switch, you may have a malfunctioning door lock switch assembly, a faulty door latch striker, or other problem. 1 – Unplug the washer for 5 to 10 minutes. Unplugging the washer will allow the capacitors on the control board to discharge the energy. If the caps discharge then the control board should completely reset. 2 – Make sure there is nothing blocking the door switch where the door and the washer meet when shut. If there is a clump of lint or similar, this can cause the error code dS as it may NOT detect that the door is fully closed. 3 – Be sure the door switch and the striker are not damaged or loose. If any component that involves LOCKING the washer door is loose, dirty, cracked, or damaged, you can get the dS error code. 4 – Use diagnostics mode to cycle the door lock assembly open and closed. If you test the door lock using diagnostic mode, you can be sure that the door switch itself is bad and not another part on your Samsung washer. 5 – If all the above did not work to clear the error code or find the problem, the door lock assembly may be faulty. Check the switch itself and the wires that go to and from it. If you find any type of damage or the switch is not working, replace it per the new door switch instructions. 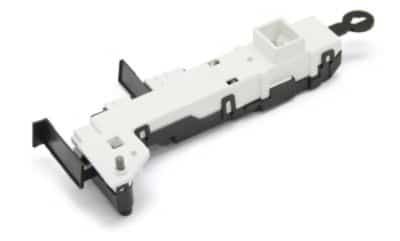 This door lock switch (part number DC34-00024B) is for Samsung washers. The door lock switch DC34-00024B locks the washer door to prevent the door from opening during the wash cycle. 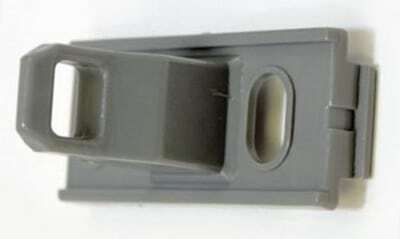 This door lock strike (part number DC66-00326A) is for Samsung washers. The door lock strike DC66-00326A attaches to the washer door and activates the lock when you close the door. This dS error code troubleshooting guide will work on all Samsung front load washers with the model numbers: 59249003, 59249006, 59249045, 59249047, 59249057, 59249065, 59249069, 59249075, 59249079, 59249082, 59249087, 59249127, 59249145, 59249147, 59249155, 59249157, 59249182, 59249193, 59249196, WD15F5K5ASG, WF330ANB, WF330ANW, WF331ANR, WF331ANW, WF340ANG, WF340ANR, WF350ANG, WF350ANP, WF350ANR, WF350ANW, WF393BTPARA, WF393BTPAWR, WF395BTPARA, WF395BTPASU, WF395BTPAWR, WF397UTPAGR, WF405ATPASU, WF405ATPAWR, WF431ABP, WF431ABW, WF461ABP, WF461ABW, WF461ASP, WF56H9100AG, WF56H9100AW, and WF56H9110CW. Need help finding the right part or need help to fix your Samsung Front Loading Washing Machine? Please leave your question below and we will assist you. The door lock assembly works (it will lock as well as unlock when it is supposed to) but I keep getting error code DS (or D5) because the washer door will not close tightly enough, specifically at the bottom of the door (the top of the door seems to have a good seal). I can get the washer to run a full cycle but only if I tape the door tightly shut at the level of the handle (oddly, it didnt work & still gave a DS error when I taped the door at the bottom, where it seemed to me where the problem was). Do I need a new door lock assembly even though the one I have seems to work as long as the door itself is held tightly shut? Or could it be something else like the hinge or…? The washer is used daily at a non profit animal rescue where I volunteer. It is very important that we can keep our special needs dogs’ bedding etc. clean and dry. I have a Samsung washer Wf364bvbgwr. I found the holding screws for the door hinge and striker are stripped and cannot be properly tighten. I tried some screws filler compound but……… If the door is open and I press door switch it will start cycle but with close door it wont. Is there any adjustments to adjust the door switch. I do not hear any clicking sound when I play with door switch. Any suggestion to fix stripped screws to make sure it is tight and also correct play on the hinge side of the door. We would suggest ordering a new door strike (that comes with screws) as if it does not sit correctly it will not sense the door is shut. Check Amazon for one or two around 10 dollars. Previous post: Bathroom Sink Drain Pipe Is Leaking – How To Fix – What To Check?